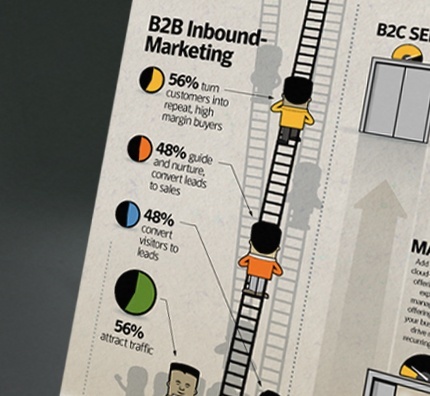 What, Exactly, Is Inbound Marketing? A while back one of our clients called and asked if we could help with their inbound marketing. I’ll confess I had heard of the term at the time, but wasn’t precisely sure what it was. I told our client so and she went off to find an inbound marketing firm. But I was intrigued, so I did some research. Wikipedia says inbound marketing “earns the attention of customers, makes the company easy to be found and draws customers to the website by producing interesting content.” Hmmmm that sounded like what we do here at Connect. Inbound marketing uses tactics like messaging, content development, website development, SEO, traditional and social media and content marketing. I realized that although I was unfamiliar with the term, inbound marketing was what we had been doing for the past 25 years. Compared to B2C, B2B typically has a high-ticket, low volume affair with long, complicated sales cycles. Nike sells millions of shoes with what amounts to an impulse buying cycle. By contrast, Cisco sells thousands of high-end switches with a multi-month or even multi-year sales cycle. All of which means a B2B inbound marketing program is fundamentally different than a B2C program. Nurturing people through the inbound process became a much more important part of the process for B2B companies. You need more meaningful content, more campaigns and more finesse to guide your leads through the cycle than B2C. Your lead volumes are lower, and how you score those leads is more nuanced. You need more human touch as opposed to the highly automated, simplistic algorithms used in B2C. Oh, our client eventually called back. She found several highly reputable inbound marketing firms, but all were B2C-focused and didn’t understand her business in the same way we do. She asked again if we would do their inbound marketing. This time we said yes.